Tens of thousands of expat pensioners may return to the UK to use the NHS after Brexit - unless a deal can be done to let them keep receiving care abroad, a think tank has warned. The Nuffield Trust estimates the cost of treating them - on home soil, rather than abroad - could double to £1bn. Currently, the UK gives about £500m a year to EU countries that care for Brits who have retired abroad. Last year, spending on the NHS in England was about £120 billion. The warning from the Nuffield Trust came as Health Secretary Jeremy Hunt told the i newspaper that the NHS could suffer if Brexit "goes wrong". 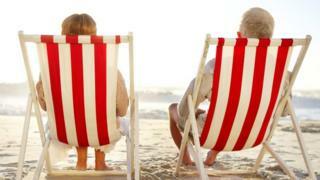 About 190,000 British pensioners live abroad. Under the EU reciprocal "S1" scheme, British pensioners have the right to go to any other EU member state and receive the same health care rights as the local population. According to the Nuffield Trust, it may not be easy to continue with this agreement after Brexit. If all of these pensioners decided to return to the UK - a big if - they could be expected to fill 900 NHS hospital beds a year, it says. The NHS would need about 1,600 more doctors, nurses and other workers to provide the care, it estimates. Also, hospitals could end up short-staffed if migration of workers from the EU slows or stops post-Brexit. And access to medicines could also become more difficult if the UK leaves the EU's medicine licensing system. But there could be gains too post-Brexit, the Nuffield Trust says. When the UK leaves the EU it could stop paying EU membership fees. Money from this saving could be used by the NHS. Nuffield Trust spokesman Mark Dayan said: "It is possible that extra funds could be found for the NHS from any cancellation of Britain's EU membership fees. "But whether or not these benefits will outweigh the significant staffing and financial costs Brexit may impose on already stretched services remains to be seen. The British Medical Association urged politicians to keep the health service and its patients at the forefront during Brexit negotiations. This issue includes the impact of the UK’s decision to leave the EU, Brexit negotiations and future relations with Europe. A Conservative party spokesman said safeguarding the rights of UK nationals in the EU and EU nationals in the UK was "one of our first priorities for the Brexit negotiations". Meanwhile Health Secretary Jeremy Hunt told Radio 4's Today programme that a successful Brexit would be important for maintaining jobs which pay taxes to increase funding for the health service. He said: "With a good Brexit we can see the economy going from strength to strength." Liberal Democrat leader Tim Farron said: "A brighter future is possible. We will stand up to a bad Brexit deal that would hit the NHS hard, and give people the final say with a chance to remain in the EU." Labour have not commented on the Nuffield Trust's report, but have accused the Conservatives of "starving" the NHS.